New band, new song, it is the Right Band singing their timely first & new tune "Remember December." A little bit different sounding in that it starts off with interesting sound & goes into a heavier rock guitar all the while holding true to their Jamaican roots with a strong reggae vibe. The melody will stick in your head and if it gets the play it needs it will pop. It's suppose to be a Christmas song from Kingston point of view. I don't get a Christmas vibe from it. One of my all time favorites from the Stoopid. This remix has Stick Figure featured on the track. Stick Figure did a dub mix of Stoopid's song "2 AM" too many years ago. This time they get the vocal spotlight and add a nice touch touch to the song that's a bit different style on the vocals and I like that style. Maybe it will be used more often. Irie G is Gregory Cyrns and the boy has a nice voice & sound. Definitely catchy and bit poppy with that sweet melody in his new song "Slow Motion." I feel like this kid is going to do big things. Cali Style. A take off of the original "Sleng Teng" riddim with a steppas/electro vibe & feel. Badda General has a decent tune called 'Dem Nuh Bad.' Kenne Blessin has gone outside his comfort zone and done well on this different type of riddim for him with 'We Tun It Up.' 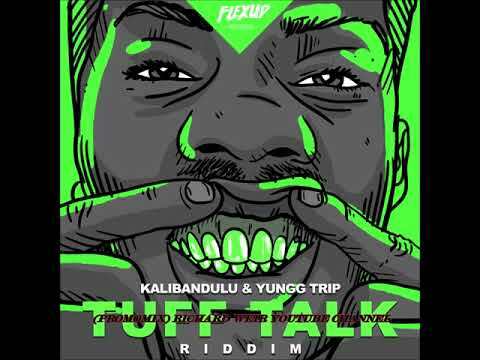 The one who 'tuns it up' & is 'badda den dem' is Joshua Hales with the riddim title track 'Tuff Talk.' 'This one ah murder' as its a cross between a girl & sound clash tune. Shauna Chyn says its a "White Christmas" because her new man make her rich inna dancehall style. If you love love the rude girl style this is your riddim. Macka Diamond sets it off with another Christmas tune "Christmas Gift." She has one wish for Santa she want back that touch from the boy who's twenty plus 7 because she thought it was heaven. D'Angel, Stacious, Pamputae & Starface keep it rude for the season. Beware this is not for the fair eared.